Features and applications: series of high-quality silicone rubber are used as rubber casing.The advantage of products is soft, high temperature stable performance. and it is widely applicable to all types of household appliances, industrial appliances, lighting, electronic equipment insulation protection, particularly suitable for handling high temperature insulation, arc-resistant treatment, treatment-resistant Corona. 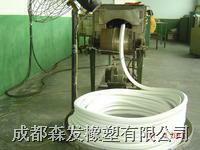 Standard colors: red, blue, white, grey, green, transparent color, may require the production of other colors.